E-cigarettes safer than smoking says long-term study - Cancer Research UK, Feb 2017. "This study adds to growing evidence that e-cigarettes are a much safer alternative to tobacco, and suggests the long term effects of these products will be minimal." - Alison Cox, Cancer Research UK. PUBLIC HEALTH ENGLAND REPORT AUGUST 2015. Extract - "E-cigarettes are 95% less harmful than tobacco and could be prescribed on the NHS in future to help smokers quit". PUBLIC HEALTH ENGLAND REPORT MAY 2014. Extract - "Electronic cigarettes, and other nicotine devices offer vast potential health benefits, but maximising those benefits while minimising harms and risks to society requires appropriate regulation, careful monitoring, and risk management". If you need general vaping advice or info about vaping hardware and e-liquids contact our helpful and friendly support team on 0121-355 7688. We have other brands of e-liquids and vaping gear in our shops that are not listed on our website - please call if you have any special requirements or would like to pre-order a NEW product. SEARCH TIP: Type the e-liquid flavour or device you are looking for in the SEARCH box at the top. All our products are compliant with the EU TPD regulations. We cannot and will not accept any responsibility for your vaping habits and use of vaping hardware and e-liquids. We cannot and do not purport to give accountable advice. The use of e-liquids, vaping tanks, coils, mods and batteries is at your own risk so take care and thoroughly research before making decisions. Electronic cigarettes and vaping devices offer an alternative to the tobacco smoking experience without having to deal with the downsides that usually go along with smoking. Vaping is NOT smoking, no smoke is produced, only vapour. As there is no flame or burning there are no by-products like smoke, bad smell, ash, butts, bad breath, smelly clothes and home; or dealing with people who get easily irritated by tobacco smoke. The only smell that may be detected the e-liquid's flavouring. As soon as the e-liquid is heated by the atomiser it is turned into a vapour which you then inhale and exhale. It is said that tobacco smoke often contains as many as 4,000 chemicals, 40 of which are known carcinogens. Vaping helps many people quit smoking cigarettes. If you tried vaping/e-cigarettes a while ago and didn't get on with it - you may now find that vaping hardware and e-liquids have evolved and really worth making a second go of it. E-liquid is available in various strengths of nicotine including zero. So no matter what strength of analogue cigarette you used to smoke, you can find an e-liquid nicotine level that will work for you. Whilst vaping, if you feel light-headed and nauseous you are probably taking in too much nicotine in one go, either use a lower nicotine strength e-liquid or reduce the amount you inhale, or lower the wattage. We also sell zero nicotine e-liquids that still give the sensation of smoking but without the nicotine. This helps people with the hand-to-mouth action and the blowing out vapour they may need to help quit smoking cigarettes. This way you can first of all work on transitioning to vaping and secondly adjust accordingly. Zero nicotine e-liquids are also used by vapers that like to create huge clouds. Zero nicotine shortfill bottles are designed to have space to add optional nicotine shots, typically to create a 3mg nicotine strength e-liquid. These shortfill bottles are an evolutionary response to the EU TPD regulations that stipulated that if an e-liquid contains nicotine at point of sale it cannot be greater than 10ml in size. 10ml bottles have little space for label content and are not as cost effective as 50ml or 100ml bottles. Zero nicotine shortfill bottles in either 50ml or 100ml give the user the option to add nicotine shots or not, and control the nicotine strength themselves. Zero nicotine means manufacturers only need to create one bottle per flavour rather than multiple for each nicotine strength. For the customer, the move from 10ml to 100ml means the price per ml has dropped over 50% for many brands. The premium e-liquids that we sell (typically but not exclusively made in the US and UK) usually contain high-quality and certified base ingredients, flavourings and nicotine and are designed, developed, tested and manufactured with higher standards than budget e-liquids that are typically but not exclusively made in China. You very much get what you pay for with regard to quality and vaping experience. This applies to both e-liquids and hardware. Cheap e-liquids and vaping hardware may not be made to the standards you deserve. The main ingredients of most e-liquids are: Food-grade Propylene Glycol (PG), Vegetable Glycerine (VG) or Aqueous Glycerine (AG), concentrated flavourings and a level of nicotine (unless zero). Nicotine itself has no discernible taste, therefore flavourings need to be added to produce a taste. E-liquids with greater percentages of VG compared to PG can tolerate higher coil temperatures and produce greater amounts of cloud. Vegetable Glycerine (VG) also known as Glycerol, is a clear, sweet-tasting, odourless, colourless, viscous, non-corrosive and non-toxic liquid. Its chemical formula is C3H8O3. Pharma-grade Glycerol is widely used for example in medicine and personal-care to improve smoothness, provide lubrication and moistness in cough syrups, toothpaste, elixirs, expectorants, shaving cream, hair products and soaps. In food, beverages and e-liquids food-grade Glycerol is used as a solvent, preservative, sweetener and thickening and softening agent. In food processing, Glycerol has an E number which is E422. It is classed as a carbohydrate. For sub-ohm vaping (using coils with a resistance of below 1 ohm) you need an e-liquid with a relatively high % of VG compared to PG. Propylene Glycol (PG) is also clear, sweet-tasting, odourless, colourless, viscous, non-corrosive and non-toxic liquid (the 'acute oral toxicity' of PG is classed as 'very low'). Its chemical formula is C3H8O2. PG goes through a purification process to produce Pharma, Food and Industrial grade PG. Food grade PG is often used by food manufacturers as an emulsifier/preservative/additive in seasonings, sauces and ice-cream, as a solvent in liquid flavourings and as a delivery system in e-liquids for vaping devices. Pharma grade PG is also used as a solvent in many pharmaceuticals, including oral, injectable and topical formulations, where the other constituents are maybe not soluble in water. In food processing, PG has an E number which is E1520. PG does not cause sensitisation and shows no evidence of being a carcinogen or of being genotoxic. It is possible that some people cannot tolerate or are allergic to PG and have experienced some minor irritation as it is so widely used in the food and pharmaceutical industry. If you have a low tolerance of PG or are concerned, do not use e-liquids. PG is NOT to be confused with ethylene glycol which is a constituent of Anti-freeze. There are numerous resources on the internet about Nicotine. We are not about to repeat or discuss the effects of Nicotine here. Needless to say Nicotine is an addictive drug therefore if you have never used a substance containing nicotine we recommend you don't start using e-liquids containing nicotine. If you experience any side effects, stop using your e-cigarette immediately and consult a Doctor. E-liquids may be poisonous if ingested. Keep e-liquids and vaping hardware away from children and pets. You very much get what you pay for with regard to tank and battery quality and the vaping experience they provide. Cheap hardware may not be made to the standards you require or deserve. To avoid disappointment and to enjoy vaping at its fullest you should consider progressing to higher-quality and therefore more expensive vaping tanks/devices that are engineered to higher standards, give you more control, flexibility and features and produce greater quantities of vapour. Higher-quality higher-powered vaping batteries last longer on a charge and give you greater control over the wattage/voltage and therefore allow the use of bigger atomisers, sub-ohm coils and rebuildable heads - which produce larger clouds which are more comparable to smoking analogue cigarettes. Using both high-quality tanks and batteries enable you to make the most of premium e-liquids and experience their tasty and exotic flavour blends, cloud quantity and throat hit. There are trusted and reputable hardware manufacturers such as SMOK, Aspire, ASMODUS, KangerTech, JoyeTech and Eleaf, and there are many new-comers, clones and counterfeiters. So take advice from an experience vaper. Batteries do not last forever - don't expect the same performance 18 to 24 months on. Always charge vaping batteries completely before using. Do not store batteries in a hot or humid environment. Do not knock or puncture batteries. Do not use e-cigarette batteries for other purposes they were not designed for. Follow the battery manual or the manufacturer's guide on their website. 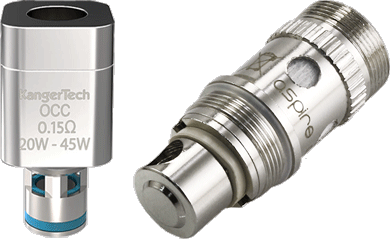 Seek advice and use the correct type of battery and wattage for your coil/atomiser. Batteries can get very hot if not used with the appropriate atomiser/coil. Low resistance coils/atomisers need suitable high-powered high-drain batteries designed for purpose. High-end vaping batteries/mods usually feature variable voltage (VV) and variable wattage (VW) controls so that you can adjust the power sent to the coil to either suit the coil's resistance or control the production of vapour. Most high-powered MOD batteries feature Temperature Control to deliver a consistent power level and therefore a consistent vaping experience. The "510" battery thread is pretty standard for most vaping tanks and batteries/mods. All vaping devices have a coil inside an atomiser that heats your e-juice - coils don't last forever - anything from 1 to 6 weeks, thus you do need to buy replacement atomisers/coils for when they stop working properly. Typically over time carbon deposits build up on the coil which reduces its efficiency. Also, the wick material can build up gunge which is residual e-liquid hardened from heating, this reduces the wick's capability to supply fresh e-liquid to the heating coil. The wick may also get burnt if too much power is applied or the liquid has run out. There are a number of rules to follow in preserving and prolonging the life of an atomiser/coil. Don't deliver too much voltage/wattage to the atomiser coil or you could burn the e-liquid which will create an acrid taste and rapidly add carbon deposits to the coil, or you might burn the wick, both of which will ruin the atomiser. NOTE: See the writing on the side of the atomiser or box/manual or study and follow OHM'S LAW to set the ideal voltage/wattage to apply. ALSO make sure that the wick material inside the atomiser is fully wet with e-liquid before you press the power button - let the juice settle and allow air bubbles to emerge from the atomiser. Top up the e-liquid in your tank before it runs dry - powering a dry atomiser is bad news! If your battery is the correct one for your coil, is fully charged and set at the correct wattage, yet you are experiencing a bad vaping experience - try a new atomiser/coil - chances are the atomiser has passed its usable life. Sub-ohm vaping (using coils that are less than 1 ohm total) and building your own coils for RBAs/Dripper Heads is for experienced vapers only. Sub-ohm vaping is at your own risk. If you're new to sub-ohm vaping then you must study it on the internet and take advice BEFORE buying the hardware. For sub-ohm vaping you need high-drain high-wattage controllable and protected batteries designed for purpose, relatively high percentage VG e-liquids and low (3mg) or zero nicotine levels. See the OHM'S LAW Calculator to work out the voltage and wattage you need for a specific coil's resistance (ohms). TAKE GREAT CARE - using the wrong battery/coil combination could cause batteries to over-heat or even explode.